1997 - Chemistry of Hale, grey blanket Appaloosa filly by Allotrope. Owned by Linda Ransom/Trumpet Farm. 2003 - Top Scholar, gray extended blanket Appaloosa Sporthorse filly by Artistik. Owned by Autumn Rupert/Twilight Mirkwood. 2005 - Drink A Beer, chestnut spotted blanket Appaloosa filly by *Ocenic. Owned by Natasha Powers/Powers Stud. 2006 - O My Darlin, grey blanket Appaloosa filly by Ima Doc O'Lena®. Owned by Kay Myers/Caballos Del Mar. 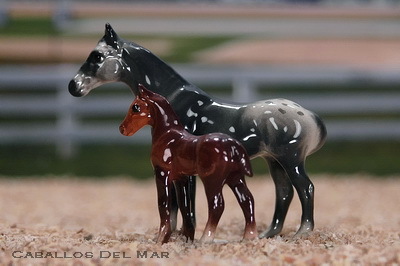 2007 - Alias Chip And Jones, bay blanket Appaloosa colt by Chips Hot Chocolate. Owned by Cindi Nakagawa/Indigo Creek Stables. 2010 - All Hale Zip, chestnut/snowflake Appaloosa colt by All Hands On Zip®. Bred and owned by Kay Myers/Caballos Del Mar.